Mandalas: In the Mandalic Tradition, the Mandala is the Woman; Mother Earth. We will gather in the beginning and end of this workshop ( in fact in all of my workshops) into a “circle of connection”thereby creating a Mandala with our bodies. Inside of this circle we are creating a safe and sacred space, a vessel to share freely and openly. We will then create our own Mandalas using a variety of creative mediums. Paint, collage, glitter and ephemera, the choices are endless. All the materials required are provided. If you would like to bring your own special piece(s) that may be significant to you, by all means, please do so. This process and indeed all of our work is pulling out from within, that which is called to be expressed and creating it into a physical form. You are completely free to follow your center when creating your unique piece of art. The Mandala is so timely right now on our planet. 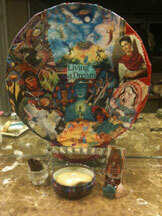 There is a parallel of “Healing of the Woman = Healing of the Planet.” Our lives are Mandalas. Find you own center first, then live your life as a Mandala. This looks amazing. Would love to see it bigger to catch more detail.